Announcement: The journal will be published twice in a year from 2019. Bulletin of Economic Theory and Analysis is a quarterly published, peer-reviewed academic journal. The journal promotes the economic analysis of both public sector and private sector. While the journal welcomes quantitative and empirical studies, it also supports the theoretical studies i.e. development of economic theories. In addition to articles on economics, Bulletin of Economic Theory and Analysis also includes studies on business, public finance and econometrics. Submission of a manuscript implies that the work submitted has not been published before and/ or it is not under consideration for publication anywhere else. Also, the article should be prepared in accordance with the “instructions for authors”. 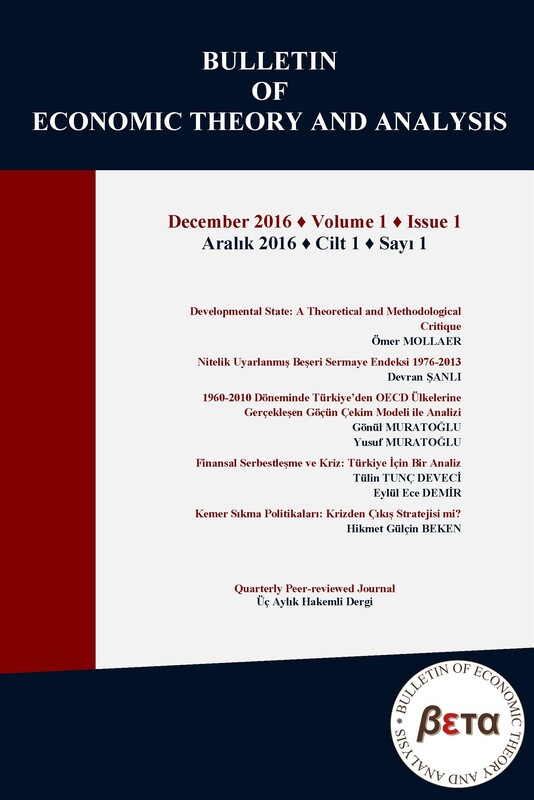 While the official languages of the journal are Turkish and English, all manuscripts have to include an abstract written in English. These instructions provide the referees fast and correct evaluation and publication process. After the manuscript is evaluated by the editor, it will be sent to two referees who are experts in their area. These referees will remain confidential and thus independent. Manuscripts can be published with the positive opinion of at least two referees. The evaluation process will be completed at the soonest time possible.